Tom Paine, in Common Sense (1776), as quoted by A Jacksonian in a comment here. Rather harsh dialectic so early in the morning but after a cup of protestant elixir it's plain, Msr. 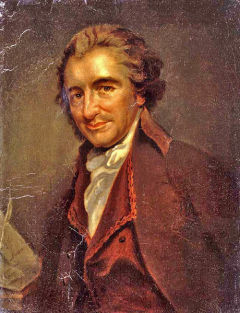 Paine's government experience was punishing. The fruit of the revolutions he charged are now governments and societies well almagamated. He may be considered as a father of USA's luxruious system of government grants and entitlements. Paine, always the Revolutionary, would perish as the French revolution consumed its own. That pretty well summarizes the arc of Revolution to Repression when we decide to make government the keeper of our virtues. The USSR learned that and we started on that path around 1909, and will learn this all over again. The one forfeits his liberty, the other his head." Let us hope we do not get to a repeat of this, again. Left a good 10% of the Nation dead, that last revolution did... we shall not be so lucky a second time around. Ever the anarchist, (antiChrist, etemology?) Msr. Paine would give me a fair stipend of right not charity as he would have all your chillin' from the coffers of USA"S bottomless sack. Others, including Theodore Roosevelt, or so it's heard, found him dispicable, a "filthy little atheist". But his head in this day abides upon the shoulders of Michael Moore some say.